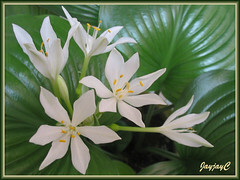 Gosh, just found out that our ‘Hosta’ is actually Proiphys amboinensis, commonly known as Cardwell Lily. Read about its ID search here. What a blessed Easter miracle! 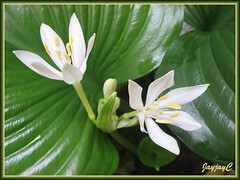 Our Hosta presented us with 2 gorgeous white flowers on Easter Sunday morning, April 12! So perfectly timed, and looking so pure and angelic as if to signify its resurrection from slumber and being completely alive with the spirit of Easter. Even its image above as captured speaks volumes for me in that I see some Easter similarities – the pureness in the petals to indicate God’s unconditional love, and the ‘outstretched arms and head of the crucified Jesus’ as depicted by the flowers and bud. Do you see the semblance? I do, as shared in my other blog. We’re definitely flabbergasted. Never before in the 7 years that we’ve been growing these Hosta plants have they ever shown any sign of blooming. For that matter, we didn’t even know that they do produce flowers until recently. Just 12 days ago, it appeared as a teeny-weeny growth, so insignificant that we brushed it aside and refused to believe its existence. Especially so, when it was discovered on April Fool’s Day! However, it begged to be seen, growing persistently larger each morning and drawing our attention and excitement. And, we monitored it closely with hopeful anticipation. What an extraordinary surprise it presented us on Easter Sunday morning! Such radiance and beauty! We’re struck dumb with awe so to speak. To experience such rarity in our little garden paradise is truly blessed, indeed! We thank and praise God for such marvels and wonders that really uplift our hearts in gratitude and joy! This showy inflorescence (umbel) of striking white flowers is simply gorgeous with one or two appearing at a time, lily-like as the Agapanthus (African Lily). The inflorescence is borne atop a 40cm long flowering scape that rise above the grass-green and beautifully furrowed, heart-shaped foliage, presenting a fabulous color contrast. 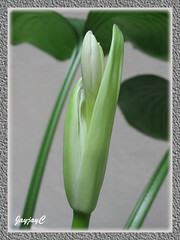 The flower head is about 15-18cm in diameter. Each individual bowl-shaped flower (5.5cm in diameter) held at the tip of its 6cm long pedicel has six white petals, each measuring 3.5cm long. We did notice one particular flower that had seven petals though, somewhat unique as captured in the above photo! Surrounded and cupped within the snowy white petals are some visibly seen yellow stamens. Very catchy! Last count today, there were 8 flowers and 6 more buds to cheer us further! Earlier opened flowers are withering gracefully, looking shriveled and discolored to a tad off-white. I will be removing them shortly to conserve energy for the budding ones. HAVE A JOYFUL AND BLESSED EASTER SEASON!! 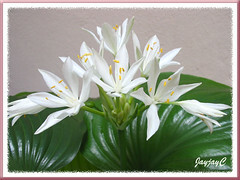 You are blessed indeed to have your Hosta plant blooming so beautifully. 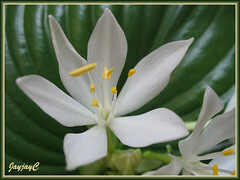 Irene has been growing these plants for more than 30 years and have never seen a bloom. Perhaps those that she grew are male ones and don’t flower. Another pot which she gave to a friend also bloomed. 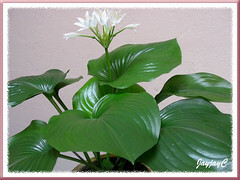 I wonder whether applying a flowering fertilizer to your plants will induce them to flower? Hope you and Irene will get to experience their beauty firsthand someday soon! I’m so glad I found the other name for this plant. I only know its Malay name as Sepuleh as told by my mom-in-law. Mine is almost dead now but I managed to snap some pictures when the flower first came out. This flower is indeed so lovely, magnified by your beautiful photo composition. I am inspired by your posts and felt humbled by your lengthy information which i know takes a long time to gather, especially because you are not a taxonomist. May i know your former profession? thanks. Thanks, Andrea! Really appreciate your visits and lovely comments…you’ve given me a good start of the day with a wide smile!